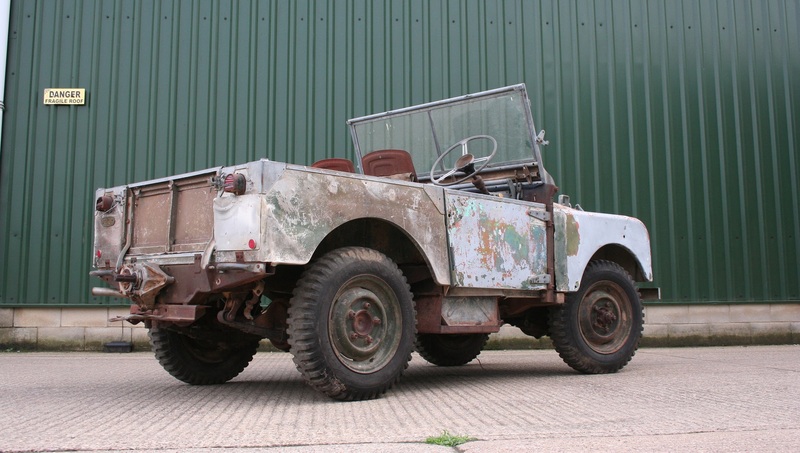 This lovely original Series One is in for a complete restoration. Bought for a customer and direct from Australia this Series One has no serious rust issues compared to a car kept in the UK. Supplied by Grenville Motors of Sydney on the 6th of April 1951 to H Lapham and Sons in Western Australia this 80″ Land Rover came fitted with a rear power take off. Great features include the original engine and radiator with the 1950 date stamp. The headlamp lenses are also original and unmarked. The build process will start with a detailed strip down, the chassis will then be blasted before being repaired where necessary and painted. We then start making new wings, doors and rear tub. Watch this space as the restoration develops. 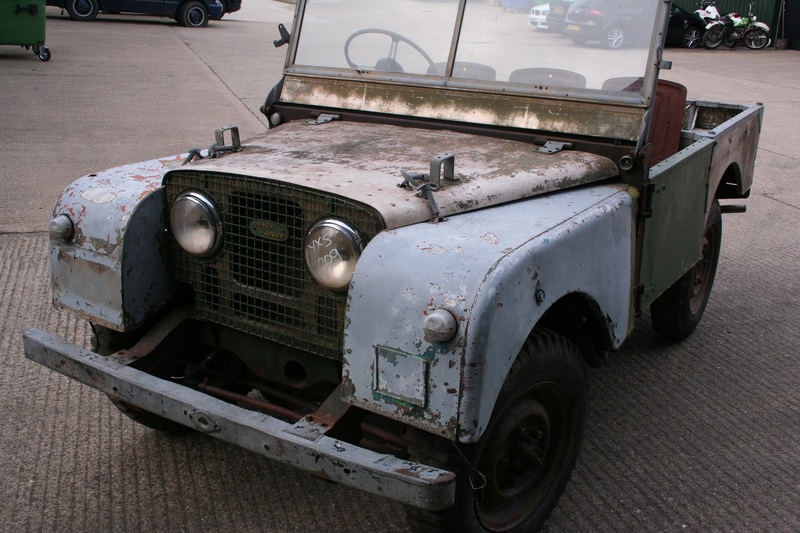 As you can see in the picture to left, when we collected this special Land Rover from Land Rover Classic themselves it was looking rather tired. The paintwork was faded and having had various jobs over the years, was also several shades of red. Now as the Fire Engine had only covered 11,000 miles since it entered service in 1998, mechanically there was little requirement for any restoration bar a good check over and a cam belt change. For the fire fighting equipment unfortunately it was a rather different story. The Godiva fire pump was seized having stood with water and foam concentrate in it for two years. All stainless ball valves were split thanks to the frost so everything had to be replaced. The paintwork and body weren’t in the greatest of shape so many hours went into the preparation in readiness for the paint. To enable us to achieve the finish we are known for at ACH, all imperfections were painstakingly removed or filled. The whole body was then primed, flatted by hand before another coat was applied. Mark spent a long time on his own in the paint booth getting the finish just right. Painting is the easy bit, preparation is everything. Once he was happy the red was layered on giving a tangible depth to the paintwork. Then the all important lacquer finish. Finally the lacquered surface is flatted by hand with wet and dry sand paper before a three stage machine polish brings out the lustre we expect from one of our paint jobs. Getting the old Godiva fire pump out of the vehicle was a serious challenge. It seems the body had been built around it and the only way out was to cut away some of the rear of the vehicle to gain access. Unlike normal Defenders where the roof can be easily removed, this one is welded on so removing it was not an option. Luckily we have a Manitou telehandler which is often our spare pair of hands and with the help of Kevin and several straps, eventually it was out. Needless to say, that particular pump isn’t made anymore. We could however purchase the new Godiva version which is quite similar. The bad news is that similar does not mean the same. So many hours later and the new pump is ready to fit. Call in the loader again and with much inching and a few choice words, it was in. Now this incredibly special Defender 6x6 Fire Engine resides at it’s new home at DCS UK Ltd in Banbury in Oxfordshire. DCS has a major distribution facility in Banbury and the Fire Engine, now fully operational is the first response vehicle for incidents on their site. The appliance will soon have it’s own building on site where it sit in wait for any eventuality. With it’s own 110 volt system, low and high pressure fire pump with foam application, 5m lighting mast and extensive equipment inventory it’s hoped that this Land Rover will go on to serve for many years to come.